Join us for a self-guided tour of Lowcountry Koi ponds where you can gain firsthand knowledge about koi, water gardening, ponds and landscaping. 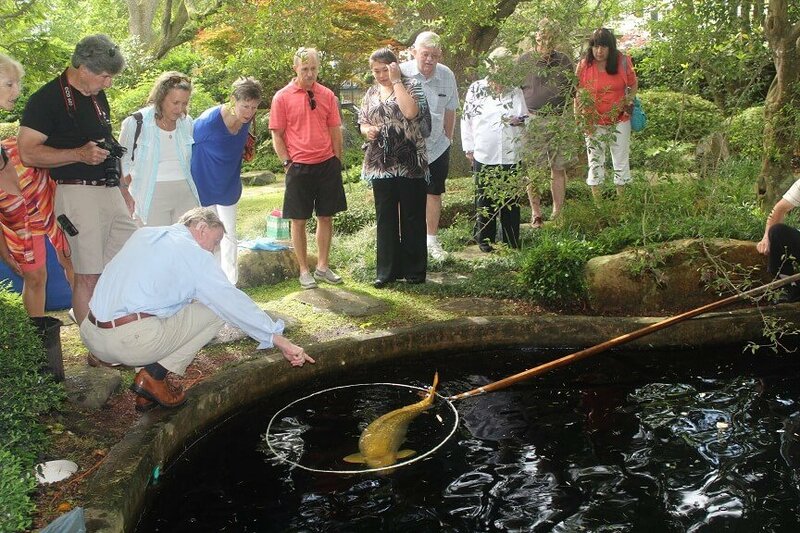 The Charleston Pond Tour is hosted by the Lowcountry Koi Club and sponsored by local vendors. Thanks to the generosity of our Sponsors and Pond Owners as well as the dedication and hard work from our members, we are proud to invite you on the tour. The 2018 pond tour is TBD around May 2018, from 9am to 5pm. There are many beautiful ponds on tour. Start at any pond and go at your own pace. The tour cost $5 per adult, kids are free. Tickets will be available on the web site 3 weeks prior to the tour. Your ticket will include a list of the ponds on display. We will group the ponds by area to help you with your travels. Tour participants will see various sizes and shapes of ponds. 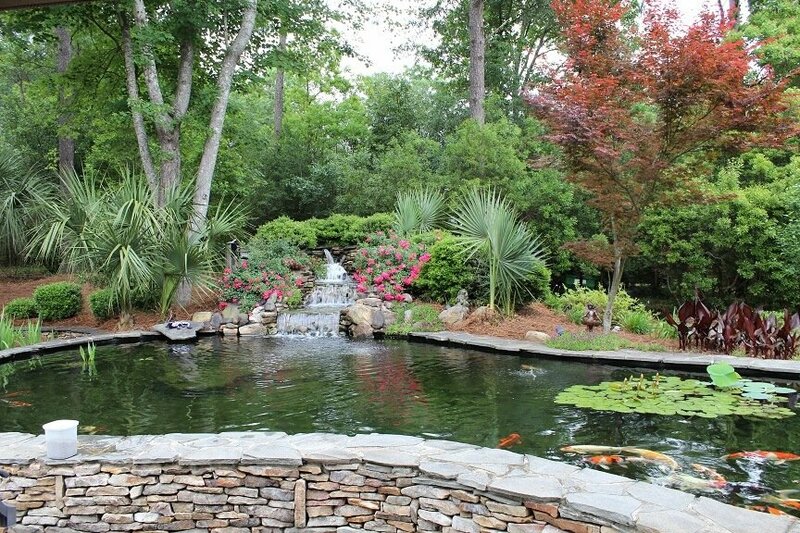 Some ponds are professionally built; others were created by homeowners. Ponds and gardens are landscaped with a variety of trees, bushes, perennial plants, herb gardens, shade and sunny gardens, grasses, bridges, unusual stones, sculptures, waterwheels and stepping stones. In the ponds are various types of tropical and native water plants, statues and various types of koi fish. Before heading out for the Charleston Pond Tour, take a look at some suggestions on Planning for the Tour. Our goal is for everyone to come out and enjoy themselves. – Get started early! There’re lots to see and little time. – Take your time! Enjoy each pond you visit and for those you don’t, there’s always next year. – Stay hydrated! It’s hot out there. – Check out the ponds and their descriptions on the Ponds and Sponsors page. Select the ponds you are interested in visiting ahead of time. – Plan your route before the day of the tour. Ponds are spread out across the Charleston area. You don’t want to spend most of the day driving back and forth to ponds. Plug in the addresses of ponds you are planning to visit and map out the most efficient route before pond tour day. – Look for pond tour signs that point you in the direction of the ponds. The residences with ponds on the tour will have a pond tour sign up in their yard. – Sign-in at the first pond, you visit with a sign-in sheet. We would love to know how many people we got on the tour this year and if you provide an e-mail address, we will put you on the list for future events we are hosting! – Plan bathroom breaks! Ponds are at private residences, so restrooms are not available for use at all pond locations. – Ask questions! Many pond owners love to share and talk about their ponds. We hope you enjoyed the tour. Please provide feedback on what you thought of the tour and/or what we can do differently in future years to make it even better.